Grab this new offer from Dunkin’ Donuts. 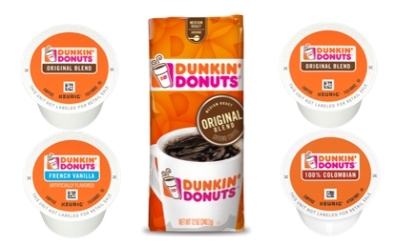 Hit the link below to reach the site and answer the 2 questions to qualify for free Dunkin’ Donuts samples. Answer the first question YES and the second question NO. Then, complete the request form and choose from the Original Blend Coffee, K-Cup Pod Pack #1 (Original Blend + French Vanilla) or K-Cup Pod Pack #2 (Original Blend + 100% Columbian). U.S. Only. Offer not valid in Alaska, Hawaii, Idaho, Montana, North Dakota, Oregon, South Dakota, Washington and Wyoming. While supplies last. Allow 6-8 weeks for processing and delivery.